Bob Tisdale shows how 'Forecast the Facts" Brad Johnson (and now Dr. Heidi Cullen) are fecklessly factless about ocean warming and the blizzard | Watts Up With That? Here’s the SST anomaly map she cites as proof in her post about the issue at Climate Central. Note that actual temperatures in the ocean are quite cold. UPDATE: If you should run into any alarmists over the next couple of days, remind them of the Northeast Blizzard of 1978. Global warming alarmists are predictable. If they see elevated sea surface temperature anomalies on a map anywhere close to a weather event, they immediately claim manmade global warming contributed, or will contribute, to the weather. They erred that way with Hurricane Sandy—sea surface temperatures along Sandy’s storm track haven’t warmed in 70+ years—and they’ve done it again with the blizzard threatening New England today. Refer to the WattsUpWithThat post Propagandist Brad Johnson of ‘Forecast the Facts’ tries to make the pending East Coast blizzard about the ocean ‘warming’ – Fails. Anyone who has followed my posts over the past 4 years about the natural warming of satellite-era sea surface temperatures understands there is nothing in the data to indicate that manmade greenhouse gases played any part in the warming. That is, the data indicates Mother Nature, not manmade greenhouse gases, was responsible for the warming over the past 31 years. The same holds true for ocean heat content data. 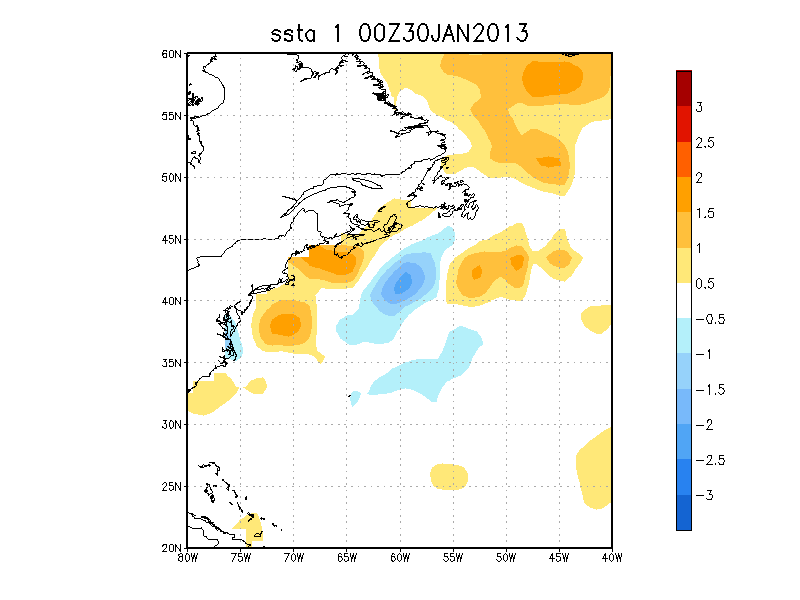 Figure 1 is a map of the sea surface temperature anomalies (Reynolds OI.v2) for a portion of the North Atlantic. It captures the data for the week centered on Wednesday January 30, 2013. The map was created at the NOAA NOMADS website, using the Reynolds Optimum Interpolation sea surface temperature data. I’ve used the contour levels of 0.5 deg C, with white set at zero, which are settings often used by NOAA. Obviously, last week sea surface temperature anomalies were elevated near the New England coast, but the data, as we will see, reveals that there’s nothing unusual about those levels. We’ll use the coordinates of 35N-45N, 77W-67W for the data in the following graphs. Figure 2 presents the weekly sea surface temperature anomalies off the New England coast, starting with the week centered on Wednesday January 3, 1990 and ending with the week of January 30, 2013. 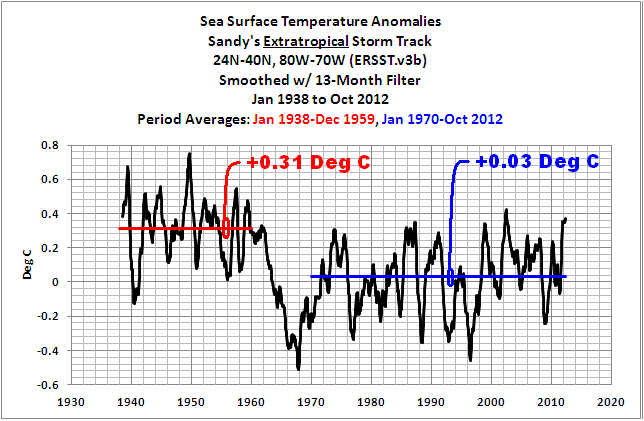 The base years for anomalies are the standard climatology of 1971-2000 from the NOAA NOMADS website. The horizontal red line represents the most recent weekly value of +0.55 deg C. Sure does look like it’s been warmer many times over the past 2+ decades. We have to switch datasets to NOAA’s ERSST.v3b for the long-term data. 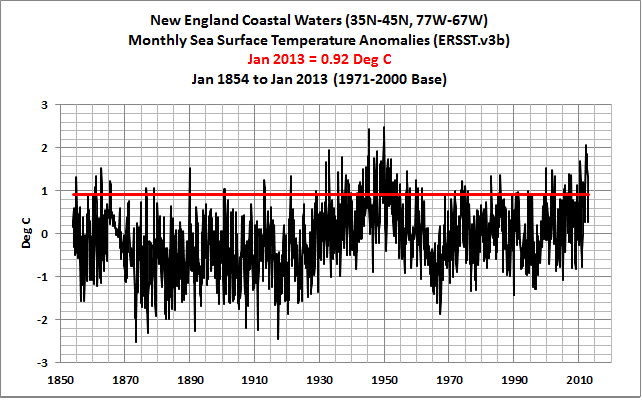 The data for the month of February 2013 will not be available until early in March, so we’ll use the January 2013 value for the most recent temperature anomaly for the New England coastal waters—the red horizontal line. The current anomalies were exceeded by a good amount in the 1940s. And they’ve regularly been exceeded as far back as the 1850s and 60s. 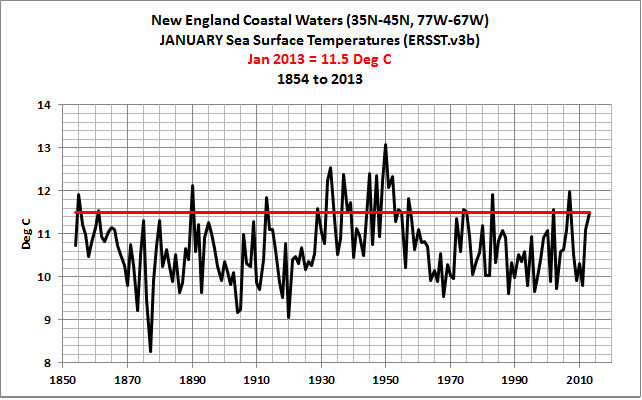 And to drive the point home, Figure 4 is a graph of the January sea surface temperatures (not anomalies) for the New England coastal waters from 1854 to 2013. Sea surface temperatures were much warmer during the 1930s and 40s. It’s difficult to claim the recent increases in manmade greenhouse gases are responsible for the warm sea surface temperatures off the New England coast, when the those values were regularly exceeded 70 to 80 years ago. Alarmists will take any opportunity to claim manmade greenhouse gases are responsible for weather events, such as Hurricane Sandy, and now the upcoming New England Blizzard. It’s often easy to illustrate the errors in their claims. Another example is the Russian heat wave of 2010 which Trenberth and Fasullo tried (and failed) to attribute to the warming of sea surface temperatures. Refer to the post here. Alarmists, of course, will continue to make unfounded claims, and I will be happy to show how ridiculous those claims are. This is a preliminary report. Sea surface temperature data for the week centered on Wednesday February 6, 2013 will not be available until Monday February 11. I’ll be happy to update this post then. The weekly Reynolds OI.v2 dataset is available through the NOAA NOMADS website. And the ERSST.v3b dataset can be accessed through the KNMI Climate Explorer. Earlier I noted that satellite-era sea surface temperature data indicate the oceans warmed naturally, not via manmade greenhouse gases. NOAA’s ocean heat content data also do not support the hypothesis of manmade global warming. Refer to my recent essay titled “The Manmade Global Warming Challenge”, which is linked to my blog post here. Refer also to the two-part video series prepared for the WattsUpWithThat (WUWT-TV) special linked to the post The Natural Warming of the Global Oceans. And of course there’s my book Who Turned on the Heat? Who Turned on the Heat? is intended for persons (with or without technical backgrounds) interested in learning about El Niño and La Niña events and in understanding the natural causes of the warming of our global oceans for the past 31 years. Because land surface air temperatures simply exaggerate the natural warming of the global oceans over annual and multidecadal time periods, the vast majority of the warming taking place on land is natural as well. The book is the product of years of research of the satellite-era sea surface temperature data and ocean heat content data that are available to the public via the internet. It presents how the data accounts for its warming—and there are no indications the warming was caused by manmade greenhouse gases. None at all. Who Turned on the Heat? was introduced in the blog post Everything You Ever Wanted to Know about El Niño and La Niña… …Well Just about Everything. The Updated Free Preview includes the Table of Contents; the Introduction; the beginning of Section 1, with the cartoon-like illustrations; the discussion About the Cover; and the Closing. 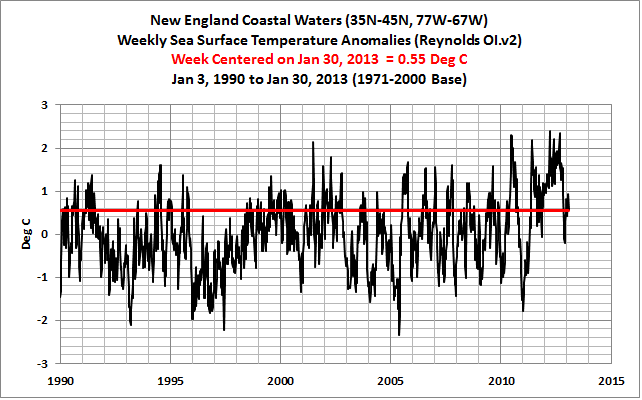 February 8, 2013 in Alarmism, Oceans, Sea Surface Temperature, Snow. Tags: Brad Johnson, El Niño-Southern Oscillation, Forecast The Facts, greenhouse gas, National Oceanic and Atmospheric Administration, New England, New England Blizzard, NOAA, Watts Up With That? What I like is her value sign facing the wrong way…didn’t she want to say > as in greater than? I was caught in the blizzard of 1978 in R.I. Our high school bus got stuck several times on the way home and we kept pushing it up hills and around stuck cars. It was a losing battle and eventually the driver, (Mr. Howard Bradley…we gave that poor man such grief) made a gutsy call and told us to get walking. It was a two hour walk in whiteout conditions without a hat or gloves on. Anyway, I got a shot of brandy from my best friend’s mom when I showed up on his doorstep looking like an icicle. I got stuck (at a keg party, as luck would have it) in another blizzard in 1981 or 1982 while stationed in Norfolk Va. While I no longer live in Virginia, I don’t believe the Norfolk area has experienced similar snowfalls since that fateful weekend when five intrepid Sailors single-handedly floated a keg. Mr. Bradley; if you’re up there watching, I’m sorry for being such a rotten snot. You can tell someone is non-technical when they don’t know the difference between ‘>’ = ‘greater than’ and ‘<' = 'less than'. Only twits tweet. Even bigger twits re-tweet. Oh, how I remember 1978. Landed in Boston on the Sunday, the storm began Monday afternoon, got the last club-car seat on the train to Newark, which took 8 hrs or so, nightmare at the (pre-reserved) Hilton, nightmare getting to DC. By Thursday was back in the air to St. Louis, but had to cancel Friday’s appt in Dallas, as DFW was iced in. Happily, made it home to Vancouver instead. I think the threat of the day was the coming ice age. Please excuse an off topic query to Bob. There was a big jump in global temperatures according to RSS and UAH between December and January. The Nino 3/4 and SOI anomalies are both negative. There is an SSW over the North pole. Could these be related in some sort of way? The author of the post at climate central you quote is Andrew Freedman, not Heidi Cullen. In it he says ‘As was the case when Hurricane Sandy struck in late October, sea-surface temperatures are running a couple degrees above average off the East Coast, which according to climate scientists may reflect both natural climate variability and the effects of manmade global warming. While he is obviously wrong to state that the waters are unusually warm, I find it difficult to disagree that, according to the graphic, ‘sea-surface temperatures are running a couple degrees above average off the East Coast’. I hope there’s thunder snow. I love thunder snow. winds going in the wrong direction…..
Tell the executive producers at the ABC, CBS, and NBC evening news programs to provide more frequent, accurate coverage on climate change! From record-breaking heat waves and massive wildfires to historic droughts and Superstorm Sandy, we’ve seen with our own eyes the increasing severity and frequency of extreme weather events this past year. Yet in reporting on these disastrous events, the nightly news programs at the major broadcast networks have largely ignored what is fueling this extreme weather – climate change. As the effects of climate change cause hardship for families across America, we need better coverage if we want people to connect the dots and demand real action to curb global warming pollution. That’s why we’re launching a petition to the executive producers of ABC, CBS, and NBC’s evening news programs, demanding more — and better — news coverage on climate change this year. Will you add your name to help us reach 60,000 signatures in the next two weeks? A recent Media Matters for America study found that ABC’s nightly news program did only one segment about climate change last year. Meanwhile, NBC’s nightly news show did only four and CBS devoted just seven segments to this critical issue. What’s almost worse is that when these networks have covered global warming, they have often treated climate change as a “two-sided debate” rather than what it really is: an issue in which there is overwhelming scientific consensus. By bringing on climate-denying politicians and pundits, and giving them as much “expert” status as actual climate scientists, the networks perpetuate the false debate that polluter-funded think tanks have instigated to cast doubt on whether we should take action to address the climate crisis at all. We need news programs that will provide the American public the facts: global warming is not a disputed “theory,” it’s a reality. I know we can persuade these networks to give us that coverage, but first we have to show that their viewers are demanding it. Will you join us in calling on the major news networks to put science center stage in extreme weather and climate coverage this year? Providing better coverage of the climate crisis and extreme weather events is not only necessary, but shows like PBS NewsHour have already shown that it’s doable. Last year, PBS NewsHour devoted 23 segments to covering climate change — almost twice as many segments as the other networks combined! PBS NewsHour’s coverage included interviews with 29 climate scientists, including NASA scientist James Hansen, who shared his findings that climate change has increased the probability of heat waves, wildfires, and other extreme weather. These segments were compelling and informative, and rightly treated climate change as a reality rather than a political issue up for debate. We can get ABC, CBS, and NBC to follow suit, but only if you take a stand today. Thanks for standing up for science and taking action today. I was living on Cape Cod in February of 1978. It was amazing to behold. We got much less snow than Boston, which got well over 2 feet. At on point on the Cape we were in the eye of the hurricane and it was beautiful with a perfect circle of blue sky directly above us with dark clouds all around. I remember seeing a news photo of a bus in Boston in which you could only see the bus destination sign near the roof line. At one point the traffic stopped dead on the 128 and they spent a whole day getting people out of their cars and back to their homes. People had to abandon their cars on the freeway and many of them didn’t want to do that. The freeway shut down for three days. I remember reading stories of people finding their dead children in melting snow banks three weeks later. It was sad. I can see now why weather.com wanted to start naming winter storms. This is all about drama now, and each new “extreme” weather event is only more grist for the mill churning out hysteria. 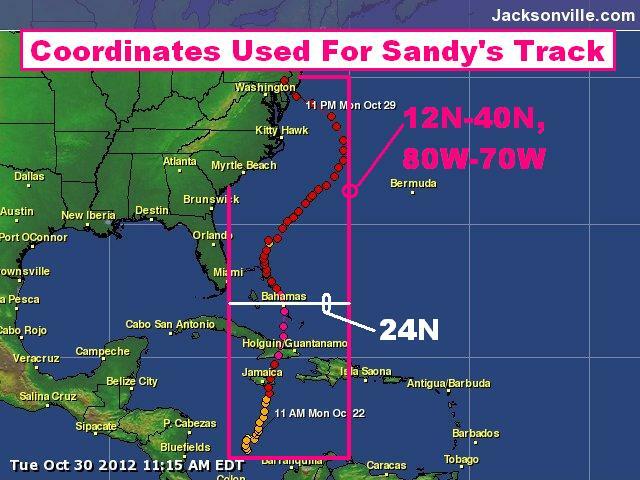 How much better to be able to refer back to “Nemo” alongside “Sandy” and “Katrina” while spewing the hyperbole. I wonder if some of the anomalies might result from meandering of warm and cold eddies of the Gulf Stream. Isn’t “Forecast the Facts” the people who want to force their belief system on all weather forecasters regarding climate change? Their must be a reason they are trying to promote the snow storm in the Northeast as being a result of man made warming. I’m curious as to what those reasons might be. Is it that the president’s SOTU speech will contain passages about heating the planet and people shoveling snow and freezing may believe that the snow storm was caused by the cold? It will be interesting to see if any weather forecasters mention man made warming as a cause of the snow and cold. First decent chance to use the snowblower this winter. I got so excited I did the homes of the ladies next door and beyond. Nothing unusual about this storm for Waterloo. I remember watching dump truck dump snow off the bridges because there wasn’t any room elsewhere to put it in Boston, NY and other cities..
Man am I getting old.. I was in the Army stationed outside Boston in 1980 and people were still talking about the blizzard of ’78. Folks were using cross-country skis to get to work. Maybe these people should read up on the Great Blizzard of 1888, too. We haven’t gotten too much snow (yet) here in western New Hampshire so far (a couple of inches). More on the way (supposedly heavy into the evening), but I’m thinking we may not reach the max snowfall depths they were predicting locally (16 inches). If the winds pick up, that will make for an interesting Saturday, however. Instead of the temperature anomaly being reported in degrees, what do they look like plotted in ‘sigma’? Directly on the map. light blue/red for ‘less than one’. moderate for ‘1 to 2’. And brilliant for 3. Because 3 sigma might actually deserve it. And something incandescent for 4. And lets not forget a week or so ealier a different blizzard had hit the Midwest. I don’t think ocean temps were involved with that one. Hey, don’t get too technical, she’s only a PhD. Heidi Cullen, an AMS Member, is Vice President for External Communications and Chief Climatologist for Climate Central, a non-profit science journalism organization headquartered in Princeton, New Jersey. She is a Visiting Lecturer at Princeton University and a Senior Research Fellow at the Wharton Risk Management and Decision Processes Center at the University of Pennsylvania. Dr. Cullen is the author of The Weather of the Future published in 2010 by Harper Collins. You are all liars! I remember 1978, it was exactly 66 degrees everyday, all day, and there was a gentle shower every evening just as I was eating dinner. It was beautiful and just and nothing was scary or EXTREME! just wonderfully placid and unchanging. I just want to remind that the idea that education should go after the “mind, heart and the soul” and try to encourage emotional visualizing of the need for change has been around about 20 years now. So the coverage of this blizzard after Hurricane Sandy is frustrating to the rational and scientifically informed but that’s a small minority of the viewing audience. Everyone else watches the visuals and hyping and infers that Something with a capital S must be done. http://www.invisibleserfscollar.com/truly-effective-teaching-involves-the-awakening-of-all-three-heart-mind-and-the-soul/ has very graphic quotes of how and why the student is targeted so that their perceptual filter as well as their habits of mind get changed. And primed to action at the spectre of any environmental threat. And again many of these students are now adults with their own families. Two generations being visually and emotionally bombarded with this message from a young age. And since the media is viewed as the other half (apart from education) of the broader Communications strategy, there is no way the typical meteorologist or newsman does not know what emotional press points they should be hitting. They simply may not know the why. To maximize the influence of created emotions and false beliefs. We are playing for keeps here with people who say repeatedly that reality does not matter to them. Perceptions drive behavior and it is making behavior and reactions predictable that is the point. Of all these continual misrepresentations. Not only was the winter 1740-1741 characterised by very low temperatures, but also by huge amounts of snow. People in the region saw this winter as the most severe since the European settlement began. There was 23 snow storms in all, most of them being strong. On 3 February about a foot of snow fell, and about one week later there were two more storms, filling the roads in Newbury, Massachusetts, up to the top of fences. Snow depths of about 3 metres were reported from some places.
. The winter of 1747-48 was one of the memorable winters that used to be talked about by our grandfathers when the snow whirled above deep drifts around their half-buried houses. There were about thirty snow storms, and they came storm after storm until the snow lay four feet deep on the level, making travelling exceedingly difficult. On the twenty-second of February, snow in the woods measured four and one-half feet; and on the twenty-ninth there was no getting about except on snow shoes”. Joe Romm at Climate Progress has now chimed in with the “warmer than normal sea temps….” =\ This is why these alarmists would love to start putting names winter storms, so that they can point a finger and say “See! Remember that storm? It was Climate disruption again!” Right!!!! It may have been warmer in the 1940’s, and the 1978 storm was colder, but 2013 is a different kind of warm. I could never figure why the alarmist camp is so afraid to have an opposing view presented on news programming. It should be easy to shut down the skeptic view if the data is so “set in stone”. However, on the rare occasion where the two sides have met, the alarmist side always appears as rather inept if not foolish. The data should decide the issue not the beliefs of the high priests. Moved from Hartford to St. Louis a few days before that blizzard, but I remember the mess the midwest blizzard left. If I saw one jacknifed truck I saw a thousand. Imagine driving thirty miles an hour through Ohio and Indiana with your two sisters in the car. Wasn’t around for the storm im ’78, but I remember the President’s Day storm in 2003. I was in Ithaca upstate NY, but my wife was in DC and I just watched the reports coming in from there. Something like 25 inches fell in Maryland just north of the beltway. This seems to me like another case of hyper-ventilation prior to the event – which people will remember long after the facts come in. Expecting 25 cm here in Ottawa – decent enough, but nothing to get excited about. Opposing Views are not allowed because… opposing views are not allowed. It’s all very Soviet, if you can “win” you first attack the opposition as fascists, capitalist oppressors, neo-kulaks, wreckers, fanatics, whatever, the name doesn’t matter, turn the public against them (another Soviet trick, bypass the media and go direct to “the masses” ala Barry Obama’s last campaign) and then you have the power to simply stamp the opposition out by whatever means you now choose. It’s right in the handbook, Alinksy got it from Stalin who got it from Lenin. Hyperbole? No, just history. The “Fed by” unusually warm ocean temperatures seems quite doubtful since the air mass started in the gulf, no? In other words, I doubt any Atlantic air will be involved. Hey, let’s not forget my Blizzard of ’78 pages! The main one is http://wermenh.com/blizz78.html and is one of my favorite pieces of prose. I was enough inland to not experience the disaster on the coast, and very thankful of that. My adenddum page http://wermenh.com/blizz78a.html has a few anecdotes and data that aren’t available elsewhere. I scanned all my photos from the storm recently in part because I now can, and in part because there may be another book about it and the author asked if he could used some of my photos. Update – 2003 marks the 25th anniversary of the Blizzard of 1978 so I’ve added a few more photos to this page. For the most part, the text remains unchanged from the original written for the 20th anniversary. Also, I’m coming across some other storm related information that isn’t readily findable on the Web, so I created an addendum page to preserve that. There’s a reminder at the bottom. 1998 marks the 20th anniversary of the Blizzard of 1978, the most memorable weather event of my life, and one I don’t expect to repeat. Other records and people can tell you about the storm in Boston or Cape Cod, this is how I saw it in Marlboro, Massachusetts. Marlboro is some 25 miles west of Boston at the intersection of I 495 and US Rt. 20. I was 27 at the time and had moved to the region in 1974. I grew up in the Lake Erie snow belt and was a skier, so no snow hater here. Before 1978, I heard many accounts of the Blizzard of 1969, including claims that people simply abandoned cars on Rt 128, a major loop freeway around Boston. I also heard that a VW Beetle, buried in the snow, was chewed up by a large snowblower at Hanscom Field. While I felt I missed a great event, I hoped I would see something comparable. January 1978 storm On Jan. 20, 1978 a coastal storm set a new 24 hour record for snow in Boston, 25.1″. I was on a fairly late schedule, so it was after noon when I dug my car out of the driveway, moved it across the street, and finished the driveway. When I went to start the car I discovered that parking VW Rabbits in snow banks was a Bad Idea and that snow had gotten on the timing belt making it slip. The engine’s timing was so far off that it had no compression and wasn’t going anywhere that day. My neighbor and I pushed it back into the parking space and I went upstairs to get my bicycle, my primary commuting vehicle. Two miles later I arrived a work and found that everyone had been sent home and virtually no one was around appreciate my bike ride. So I worked for a while and went home to read the service manual to see how to fix the car and did that the next day. All in all, a big storm, but a big disappointment. January 1978 ice stormOn Jan 26, another storm came through well to our west. I do not remember it at all, and was only recently reminded about it. A couple days ago I looked up accounts in the New York Times to try to find something to trigger my memory. This was all rain in Eastern Massachusetts, but in Michigan and Ohio it was a major blizzard and perhaps the worst in their history. It set the record low pressure in the US for a non-tropical storm and brought 100 mph winds to Cleveland. From snow maps in Weatherwise Magazine it looks like the rain reduced our snow to about a foot, and to a few inches at the coast. The only memory trigger I found was that a Soviet spy satellite had malfunctioned and reentered over Canada. It carried a nuclear power supply, and people had to hunt down the various fragments that reached ground. I think this photo is from the right period, perhaps our rain was freezing. February 6th dawned gray but dry. The forecasts were talking about another major snow storm, but it looked like I could make it to Maynard for a morning talk by Vint Cerf, one of the Arpanet pioneers, and get back to Marlboro before the roads got too bad. I put my cat outside to give her some outside time while she could still walk on top of the snow. After the talk, Vint said he was going to Marlboro for a meeting, but would be back to talk to engineers in Maynard. So I decided to stay in Maynard until then. The snow started a little before noon when I went to a restaurant for lunch. After lunch it was already snowing heavily with an inch or two on the ground and I knew the cat was going to be annoyed with me. Vint spent more time in Marlboro than expected, but did return to Maynard where we had good chat until about 5:30. Vint left to spend the night at a hotel in Boxboro, and I hurried out to get home to catch Bruce Schwoegler on WBZ. It hadn’t occurred to me yet that the only story that evening would be the storm. The first leg, Rt 117 to I 495 must have been pretty easy because I don’t remember much. I had the road to myself, so I made pretty good time. I 495 was unforgettable. It hadn’t been plowed recently, and might have had more snow than Rt 117. The wind was now a crosswind and driving was more of a challenge. There was no chance of seeing lane stripes, and there wasn’t even a trace of where other cars had travelled, so I tried to stay centered between the guard rails and stakes along the road. The whiteouts were short enough and the road straight enough so I settled on 45 MPH as a “safe and prudent” speed. Where the road surface was built up the wind blew much harder. In the midst of one whiteout I felt the car moving sideways. Easing up on the gas stopped the slide and when I could see the guard rails again I recentered and got back up to cruising speed. By then I realized there were two things I was racing against. Not only would I barely catch Bruce, but I was getting concerned about the snow on the exit ramps, especially after passing an exit with a vehicle stuck on the ramp. No one else was traveling, so I wasn’t too concerned about my ramp getting clogged just before I got there, but I really wanted to deal with as little snow on the ramp as I could. After passing a couple more vehicles abandoned in exit ramps, I decided I needed to be ready when I reached Marlboro. I normally took Rt 20 West, but taking the East cloverleaf was okay too. Going beyond Rt. 20 had too many risks of not getting home, so I decided that if Rt. 20 West was blocked, I would go East no matter what shape the ramp was in. Well, West had a car or two stuck, but East was clear, and even seemed to have less snow than the freeway. The last mile was easy, and the pile of snow at the end of the driveway was just what I expected – a plow had come by around 3 or 4 PM and hadn’t returned. The cat crawled out from under the deck and and into snow deeper than she was tall. Still, she managed to give me her most reproachful look. After the news, I figured one good trip deserved another, so I dressed for the weather, including ski goggles, and walked to work, about two miles away. This may have been a more dangerous thing to do than the drive home. If power had gone out, it would have been seriously dark, moon or no moon. The route to work has enough street lights and so following the road was no problem. The grounds around the office building include some woods and an apple orchard. In fact, the orchard is a nice little shortcut and I decided to take it, figuring I’d be able to backtrack if necessary. Once away from the lights, blowing snow and the dark made it very hard to see the shape of the snow on the ground. In a couple places I waded through waist-high drifts and then stepped onto bare ground without seeing that the drift ended. Fortunately, I could see enough apple trees to keep my bearing and safely reached the driveway. I don’t know if I could have backtracked, and was relieved I didn’t have to try. The (stranded) security guard was surprised to see someone crazed enough to come to work, but told me a friend had driven home, grabbed a sleeping bag and food and came back, figuring work was more interesting than his apartment. I don’t think I did much work, and walked back home, without taking the shortcut, to catch the 11:00 PM news. What’s wrong with this scene? Blizzard of ’78: Neighbor’s car The first thing I did the next morning was to look out the bedroom window and saw that my familiar world was, well, unfamiliar. I saw a drift covering half my neighbor’s front door and made a mental note I should leave via the door on the second floor. Then I realized my neighbor’s driveway was gone. Not quite, as I found the roof of his car. Then the car’s radio antenna. No hood, no trunk, no windows. And I understood how that snow blower driver didn’t see the Beetle. The snow had stopped, the wind had died. Time for breakfast, time for pictures, time for digging out. No time for work, as Governor Dukakis, wearing a Cardigan sweater, was on the TV declaring that the state was closed and that only plows and emergency traffic was allowed on the roads. I also walked around the neighborhood taking in the scene. I guess the plows must have made it through sometime that day, but I don’t recall when. The cat was not impressed with the canyon I created digging through the drift that blocked my door. That night I called the Boxboro hotel and was put through to Vint Cerf. He said he had some work with him and that the hotel had plenty of food. I told him I hoped he had plenty of work. Blizzard of ’78: Roadhouse restaurantWednesday dawned bright and clear. Governor Dukakis, wearing a Cardigan sweater, explained that people would have their car’s registrations confiscated if they were caught on the roads. That sounded like I could ride my bicycle. Let them take my car’s registration! On East Main St. the road was bare, and a photographer for the South Middlesex News snapped my picture. It was on the front page the next day. The caption reported that I was bicycling to work, and a few coworkers commented that was an odd place to be since home and work were both west of town. Back on the west end of town, I checked one of our favorite restaurants. Their doorway was on an inside corner and its drift reached the roof. The path had been shoveled part way to the door, but the shoveler was nowhere to be seen. I felt a strong sense of despair lingering in the air. Robert Frost would have written a poem. Blizzard of ’78: I495 and Rt 20 Interchange Nearby was the I 495 and Rt 20 interchange. A few more people had come through after me, somewhat to my surprise. I could tell because the ramps still hadn’t been plowed and the vehicles were still stuck. The ramp I had taken Monday evening had captured two tractor trailer trucks. I left my bike in the snow in the ramp, and walked up to the top of a rock cut to photograph the scene. I was beginning to head down when I saw a plow on Rt 20 turn onto the ramp. He was only turning around, but I had started hurrying to rescue my bike and slipped on some ice left by the previous storm. This sent me sliding down a 45 degree slope to the edge of the cut. I tried to dig in my boots at the lip, but to no avail, and I went sailing off the edge. Being a veteran of jumping and falling off roofs in Ohio winters, I knew the landing would be soft so I held the camera away from me to keep it out of the snow. Still, the camera wound up between chin and knee and the lens scraped my chin. Blizzard of ’78: I495 snow plow and car From there, it was into work and more pictures. I stopped to watch some snowplows on I495 and wonder if the driver would miss a car buried in the snow. (He drove around it.) At work, long ridge near the door had made a big drift on the downwind side, so I dug a tunnel into it, turned right, and made a “room” tall enough to sit in. Sunlight shining through snow or ice develops a turquoise color that appears nowhere elsewhere. A workman called into help dig out took a picture for me. My friend from Monday night was still inside, no longer happy about being stuck at work. I got some real work done that day, and the rest of the week. On Friday, Vint Cerf made it to Logan airport and successfully escaped. I think Friday was when Governor Dukakis, wearing a Cardigan sweater, said that the state of emergency would be lifted the next day and encouraged business owners to pay employees for time lost. That seemed like a great way for the state to protect its income tax revenue, but I didn’t get double time. This account is far too long, but I wanted to record the complete story from my point of view. Accounts in the news media had to cover a much wider area. There was no space to cover a story like mine – or yours. My experience is vastly different than other people in the area, I would have had a vastly different experience had I lived on Cape Cod or Cambridge or commuted on Rt 128. In many ways, Marlboro had it easy! We have not had another storm like the Blizzard of 1978. While there have been some big storms, none have had the same impact on as large an area or as many people. Perhaps Massachusetts deals with storms better and has enough equipment to stay ahead of the storm. Perhaps people can put more faith in the forecasts thanks to the better computer models we have now. A generation learned that week to pay attention to the forecast, and I think employers are more willing to send people home early. The timing of the storm maximized the impact. Had the snow started before 7:00AM many people would have stayed home. Had it started after 3:00PM, people would have made it home. On Saturday or Sunday, people could have coped better. The storm set Boston records for 24 hours (23.6″), single storm (27.5″), and total snow depth (29.0″). Marlboro had more. On December 13, 2007, the area had a reminder of the hazards of mid-day snow storms. A storm that started late morning led to many employers letting people out of work around 1:00 PM. The ensuing traffic jam and gridlock was so severe that mayors of Boston and Providence were taken to task for the mess and the director of RI’s Emergency Management Agency was fired. For me, 1978 was the perfect year for such a storm. I was old enough to realize the storm was historic, young enough want to seek out its adventures, immature enough to take a few risks, but mature enough to do so fairly safely. Finally, I met the storm of my dreams, but I don’t need it back. Still, wouldn’t it be interesting to repeat that storm some Monday? Don’t forget my addendum page! Contact Ric Werme or return to his home page. You had a total of 432 cm[ 173 inches or 14 feet ] of snow during that winter. The most significant one was December 2007 with 121 cm[ or 4 feet of snow ]. If you recall there was a real emergency in Ottawa as many roofs started to collapse because of the weight of the snow . Stay in your homes and do not drive. I get so tired of the “fed by unusually warm”, “warm anomaly”, etc. when the deviations are +/- 1 C from “normal”. Here’s an interesting fact y’all can try at home. In my neck of the woods (Wisconsin), this January we had exactly 3 days when the daily temp as within +/-1 C of “normal”. By the way, our highest “Hi” was 58F and our lowest “Hi” was 5F. This is the VARIATION that typifies a NORMAL winter in Wisconsin. 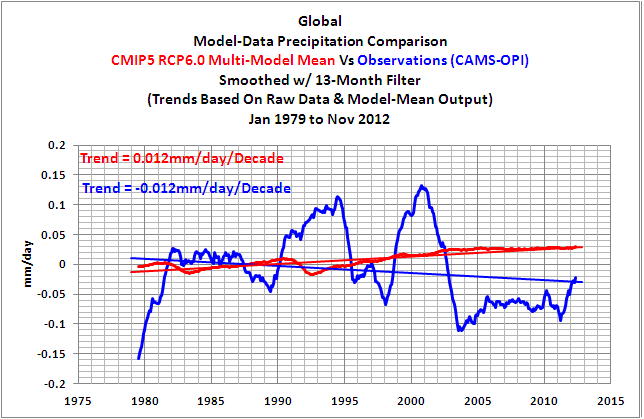 Why is it that the pro-AGW team talks as if weather should be constant?? The water is 1-2 C warmer than the long-term average??? Who gives a sh*t?? Tell me something about the NORMAL VARIATION in the water temperature and then we can have a discussion. Instead of the temperature anomaly being reported in degrees, what do they look like plotted in ‘sigma’? Directly on the map. light blue/red for ‘less than one’. moderate for ’1 to 2′. And brilliant for 3. Because 3 sigma might actually deserve it. And something incandescent for 4. Yes, this. I too would like to know how big a deviation the “unusually warm ocean temps” are. My guess is < 1 sigma. I can see now why weather.com wanted to start naming winter storms. Brian, you are absolutely correct about them wanting the “drama”. They are doing everything they can to manufacture drama. Every time they post a new “named storm”, I just want to puke. I am getting so sick and tired of them labeling everything with a name in an attempt to personalize weather events. Just sickens me. They care more about the drama than the weather. It may have been warmer in the 1940′s, and the 1978 storm was colder, but 2013 is a different kind of warm. Yes. This time it is snowing …. and blowing! That’s waaaay different than back in ’78 when it was blowing…. and snowing! It’s a Man Made Global Snow Job, for sure DR!!! I’ve shoveled and plowed out after winter blizzards, no different than this one, that occurred in Wisconsin, Arkansas, Massachusetts, and Washington state, in decades from the 60’s to the present day. There is nothing different about this storm or this ‘warm’. It is what normally happens in winter, in the temperate regions of the Northern Hemisphere. You will simply have to learn to embrace natural weather diversity, DR. Yes, 2007/8 was a good one. But they did the usual and moved the snow out of the way so I don’t think I missed a day of work because of blocked roads. In one place, the snow dump still hadn’t melted by July, I remember a radio competition on when it would all be gone! As you say, the biggest fall was over Christmas so they had some time to get it sorted, but where there is regular snow, you plan for it. I have a friend who drives a road grader in the summer and a snow plough in the winter (it might well be the same equipment) and he points out that even though you can fit a plough to a dump truck, you still have to know how to plough snow and what to do with it. In DC in 2003 they would plough the main roads amd block all the side streets, only to plough the side streets and block the main road again! If you only get to plough snow once every five years, you are not going to know what to do with it. Thanks, Henry. He quoted Trenberth. And people still talk about 1888, but it doesn’t evoke memories. Sorry, Jim. I haven’t spent a lot of time studying sudden stratospheric warming events. I also try not to pay too much attention to the month-to-month wiggles in TLT. There are too many wiggles and way too many factors that can impact them. Is part of the recent warming a lagged response to the El Niño conditions we were seeing back in October? 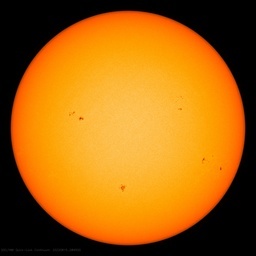 Did the oceans release heat to the atmosphere last month as Roy Spencer believes? Henry: I’ve added a 3rd update to my cross post and given you a hat tip. True. This one might actually deserve a name but I think the efffect of naming every snow storm this winter may actually lessen the memory of it later. Instead of it being a (potentially) historic event it will be just one of many to those who didn’t live through it. They’d do better to let the event itself call for a name. PS The winter systems The Weather Channel insist on naming have been no worse, as winter systems go, than a summer systems. They just include snow. Will TWC now start naming summer systems? “The Great Drizzel Heide”. A picture is worth a thousand words. They published a bunch of pictures of stranded cars after the 1978 blizzard, while urging people to get off the roads by noon, up here in New Hampshire. I think it worked, because when I drove home at 3:00 the roads were surprisingly deserted. Unfortunately it also made people foolish, and drive very poorly, in the morning. I saw a pretty bad crash, when there was barely a dusting on the roads. Panicky people shouldn’t drive. Completely off topic question. Everyone is talking about the energy budget e.g. watts per square metre in v.s. watts per square metre out. What about energy that gets chemically converted and is trapped long term. Is that not what fossil fuels are? Shouldnt work performed by incoming radiation be included in the energy budget. Anyone know how many watts per square metre this might involve? For the Warmistas, in order to explain cooling, it’s any port in a storm. Great pictures. They seem to mix the Midwest and Northeast blizzards. > What I like is her value sign facing the wrong way…didn’t she want to say > as in greater than? No, she got it right. You (and others here) got it wrong. The prediction is 18-24 inches which is up to 2ft (that is, less than or equal to 2 feet). NE blizzards of 69 (and iirc 62/63) dumped 40+ inches here in bangor maine area. how much agw was that? lets not forget 1898 (iirc) that changed rivers and coastlines here in NE area. Heidi Cullen is nothing but a quack. I am still amazed she was called to testify recently in congress…to have her as one of the opposing lecturers against Richard Lindzen is an insult to Lindzen’s intelligence. Cullen claimed a flood in Tennessee was a 1 in a 1000 year event and also misrepresented the temperature increase from a doubling of co2. Lindzen gave the correct answer and then she basically presented positive feedbacks as settled science and said we can expect like 8 degrees fahrenheit of warming because she is an idiot. Dr. Cullen tweets that the storm “could dump < 2 ft. of snow". That's less than 2 feet of snow. Heck, she could have tweeted that the storm is going to drop 2 ft.” (greater than) and didn’t know the difference? Just wonderin’. My previous post is not what I typed. She could have tweeted that the storm is going to drop less than 10 feet of snow and been just as accurate. Do you suppose she meant greater than 2 feet and didn’t know the correct symbol to use, or didn’t know the difference? The storm of 1888 dropped 47″ of snow on Albany. Imagine trying to deal with that mess with no power equipment. I’m beginning to wonder whether Heidi Cullen’s PhD was in Dramaqueenery. They did have power equipment. Here’s a 4 HP snow roller – http://cdi.uvm.edu/collections/item/uvmsctous2013 . Snow rollers predated snow plows and were used to pack the snow so 1 and 2 HP sleighs could pass readily. I’ll go with Dr. Heidi on this one, although to be safe I would have made that 2 a 4 . Making a prediction is easy if you know the outcome. A glance at the NOAA Storm Total Snow Forecast map : http://wattsupwiththat.files.wordpress.com/2013/02/stormtotalsnowfcst1.png?w=640&h=553 reveals large areas of > 24 inches predicted across Massachusetts, including Boston. Dr. Cullen referred to the #blizzard, and not just snowfall through 1PM Saturday. I think she got her greater than/less than symbol backwards. February 8, 2013 at 1:21 pm ?? For what it is worth, and that might not be much, the wiki entry on efficiency of photosynthesis claims a value of 3% to 6%. To work from there you need to know how much photosynthesizing material is involved and that is a three dimensional thing, including all land and water. Also, what is meant by “long term?” What does one do with grass, woody plants, fast growing trees, Bristlecone Pines, buried algae, and so on? I’ll guess any attempt to do this will have wide error bars. However, note the difference in language, making it hard to know what is being said. The language may imply a world-wide sq. m. number or may imply the same thing as in the wiki entry. This is not a problem I want to work on – unless there is lots of money involved. Trenberth and Hansen claim 4% and 8% increase in water vapor fuels extreme weather. Can you post info about the water vapor content when you debunk these claims? anomalously warm, and probably did warm over the past 40 or 100 years. a primarily extratropical type although hybrid storm. flood record for the Schuylkill River in Philadelphia still standing. As A kid in the 1950’s just south of Syracuse NY, I can remember climbing up the snow drift to stand on the roof of the garage and stepping OVER the telephone lines to go play in the field across the street. I spent the winters on cross country skis because I was so short I would sink in over my head if I tried to go outside in just boots. I remember the winter of 1978 too. Back on skis again this time in the Rochester NY area. We also had a doozy of a snow storm in South Carolina in the winter of 1972/73. As E.M. Smith said in another comment, time to send the CAGW crowd off to the rest homes to talk to the old grannies about the weather in the 1930’s, 40’s and 50’s. mojomojo says: “Trenberth and Hansen claim 4% and 8% increase in water vapor fuels extreme weather. How are they determining those percentages? Climate models? mojomojo: Sorry for the shortness of the last reply. The electric power is shutting off here occassionally. I’ve lost two relies so far tonight. Let’s hope I can finish the rest of this one. You need to check your comprehension skills. She uses “life-threatening” and surely intends to convey the message that there will be a lot of snow. 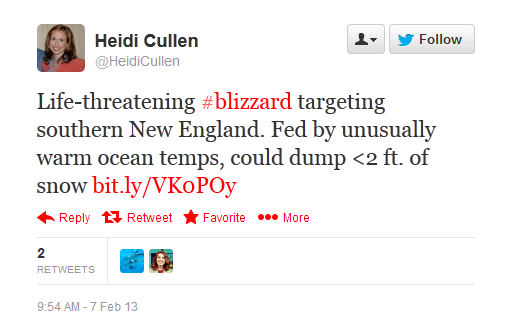 Do you think she wants to say “life threatening blizzard … could dump less than two feet”? Trenberth 4% Hansen 8% were both making news soundbites a few years back. As far as I know they didnt bother to cite any actual studies. I guess ,that was the origin of the current MSM meme, that says higher temps cause increased water vapor which is steroids to extreme weather.. The increased water vapor is what is supposedly fueling extreme weather. Im curious what the facts are behind Trenberth and Hansens % statements . But more important would be a refutation of water vapor increase at specific weather events such as Sandy and todays NE blizzard and every extreme weather event in the future. My guess is that Hansen was deriving a hypothetical figure of 8% increase in WV from 1C rise in temp .But presented the figure as fact. While NOAA measurements show a global decrease in water vapor for the past 60 years. Photosynthesis, like solar cells, is endothermic, meaning, the energy converted into chemicals in the case of plants or the energy converted to electricity in the case of PV, is not converted into heat. Photosynthetic plants convert about 7% of the light. A square meter of surface receives 1 kW during full insolation (it’s 1350 W/m^2 at TOA but the atmosphere is not perfectly transparent). And we can assume that in fertile areas 100% of that square meter is covered with phosynthetic plants. Seasonal effects in the higher latitudes play a role of course. But about the trapping: Since white mould has developed no new coal is formed – the mould breaks down lignin. Our coal deposits stem from a time when wood did not rot away. Lignin is a biological polymer and the fungi had to develop enzymes to break it down. If we don’t use the wood it will be consumed by fungi. No significant “trapping” occurs anymore. I love the idea that the blizzard is ‘targeting’ something. That tells me that the blizzard is a conscious rational creature with intent. Obviously Gaias evil twin. Hey andyd…so I guess she got it right and the forecast map is wrong? Bob, what you write and explain is such good brain candy! You have engaged us in top-notch logic applied to scientific data. What you do to the data debate, Lord M does to the rhetorical debate. It’s a one-two knock out punch. Wonder what the Arctic ice was doing when the heat was on in the 30’s? You don’t suppose it looked a lot like it does right now in the Barents Sea?